This biography of Yakov Sverdlov (1885–1919) was written by Klavdiya Sverdlova, his wife and companion. She shared his life in the revolutionary underground and suffered arrest and exile with him. We do not agree with the political perspective of the author, but reproduce this text for reference. Readers should see more information in the comments below. Sverdlov's was an inspiring life: he was an eminent Communist Party leader, a prominent revolutionary activist and a man of great personal charm. The book is intended for the general reader. Translated from the Russian by Liv Tudge. Yakov Sverdlov's life is certainly deserving of serious study, but readers should be warned that this biography is a hagiography written by a Stalinist hack. Controversial aspects of Sverdlov's life are either completely ignored, e.g. his first marriage (he abandoned his wife and daughter), or fictionalized (his relations with Stalin). This book is really more interesting in general to know the working of the party and history of the class struggle. And Klavdiya was herself a revolutionary, already before she met Sverdlov. Less interesting aspects of his life can be ignored (that he had a first wife and daughter was well known, it is also mentioned in the 3-volume of his writings). For a more hagiographic description see perhaps Trotsky. I don't know what you refer to by "fictionalized (his relations with Stalin)". The betrayal of Kamenev and Zinoviev caused uncontrollable anger of Ilyich. 18 and 19 October, Lenin appealed to the Central Committee with letters, which revealed the depth and consequences of the betrayal of Kamenev and Zinoviev, and demanded the immediate expulsion from the Party. On October 20 there was a meeting of the Central Committee, to discuss the letters of Lenin. Lenin could not himself be present at this meeting, and Yakov read his letter to the Central Committee. The first floor was taken by Dzerzhinsky. Felix offered to immediately suspend Kamenev from political activity. Stalin, who took the floor after Dzerzhinsky, offered to take as yet no decision at all and put the issue to the Plenum of the Central Committee. Milutin not only joined this opinion, but began to argue that "nothing much happened." Then Sverdlov took the floor. "The issue should be resolved today, we have present a sufficient authority and must give an answer to the statement of Lenin ... To expel [them] from the Party the CC members are not competent to do - said Yakov, - but it is necessary to withdraw Kamenev from the Central Committee." The Central Committee made a decision: to withdraw Kamenev from the Central Committee and prohibit Zinoviev and Kamenev any action against the decisions of the Central Committee and the intended line of them. Less interesting aspects of his life can be ignored (that he had a first wife and daughter was well known, it is also mentioned in the 3-volume of his writings). 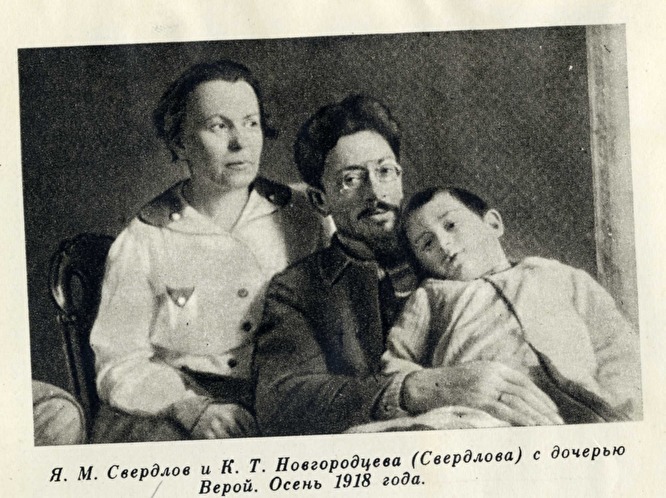 And yet it seems strange that in a full-scale biography of Sverdlov there is no mention of his first wife Yekaterina Schmidt (also a revolutionary) and their daughter Yevgenia, who grew up to become a Party member. It was certainly not uncommon for professional revolutionaries in those days to abandon their families; many examples (like Stalin) could be found just within the Bolshevik Party. I don't know what you refer to by "fictionalized (his relations with Stalin)". The publishing history of Klavdiya’s biography begins in 1939, so far as I can tell, with subsequent editions in 1941, 1946, 1957, 1960, and 1976; not to mention numerous foreign language editions. The editions published during Stalin’s lifetime depicted warm, comradely relations between Sverdlov and Stalin. The editions published after Stalin’s death mention Stalin much less often and in a neutral way. Incidentally, Klavdiya insists in the 1976 Russian edition of her biography that Sverdlov and Stalin never collaborated in editing Pravda in 1912–1913, but this is patently false. This is part of Klavdiya’s attempt to distance Sverdlov from Stalin in the post-Stalin era. Stalin was the only other political exile in Kureyka. He and Sverdlov were originally living in the same house. Stalin seduced the landlord’s 13-year-old daughter, a liaison which led to two pregnancies (only one child survived). The girl’s father complained to the police and the matter was settled only when Stalin agreed to marry the girl when she reached the legal age (a promise which was never fulfilled). This was a scandal even by the rather loose moral standards of the Bolshevik elite. The ideological leader of the Bolsheviks in the Arctic was Sverdlov. When [World War I] began and contact with Lenin was broken off, he convened a meeting of the Bolsheviks in the village of Monastyrskoye. They adopted a resolution against the War, against supporting the government. Stalin sat at the meeting, but never said a word. In spite of this, he was elected to the commission assigned to draft the summary document. Stalin got up and left the meeting without saying anything. After the meeting there was another incident, apparently in Kureyka. Some drunken criminals burst into a room where Sverdlov and Boris Ivanov were sitting. They attacked Sverdlov, intending to kill him. Ivanov was a healthy, young worker and when they pounced on Sverdlov he seized a heavy oaken bench and used it as a weapon against the criminals. It was only by chance that Ivanov was visiting Sverdlov. He managed to beat the criminals with the bench and they backed off without accomplishing their mission. When Ivanov questioned them, they told him that Stalin had bribed them and got them drunk. Ivanov suggests that Stalin was envious of Sverdlov’s close relations with Lenin. Stalin was famous for holding grudges, for decades if necessary, and then acting with murderous intent. In Sverdlov’s case he may have acted precipitously. Kamenev, to take only one example, has been almost entirely bowdlerized from the English edition (mentioned twice – negatively), although he is mentioned frequently in the 1976 Russian edition (55 times). This book is really more interesting in general to know the working of the party and history of the class struggle. Only if you like history that has been sanitized and censored to conform to the current Party line. The editions published during Stalin’s lifetime depicted warm, comradely relations between Sverdlov and Stalin. The editions published after Stalin’s death mention Stalin much less often and in a neutral way. I do not have the old editions, so I do not know what you meant by depicting "warm, comradely relations". From a 1939 publication of Sverdlov's writings Trotsky already inferred that relations were not comradely. What interests us most in that letter is the restrained characterization of Stalin as “a good chap, but too much of an individualist.” The first part of the testimonial has the obvious aim of softening the second part. “An individualist in everyday life” meant in this case a man who, being obliged to live side by side with another person, did not take into consideration either the latter’s habits or interests. “A semblance of order,” on which Sverdlov insisted unsuccessfully, called for a certain voluntary self-limitation in the interests of one’s roommate. Sverdlov was by nature a considerate person. Incidentally I had many occasions to meet the assertion, widespread in our historical literature that Yakov Sverdlov in late 1912 - early 1913, worked in St. Petersburg together with Stalin, while this is absolutely wrong. Yakov arrived in St. Petersburg in the days 20s of December 1912, when Stalin was no longer there, going abroad. Stalin returned from abroad in mid-February 1913 after the arrest of Sverdlov, they did not meet in St. Petersburg and did not work together. First time after Narym Sverdlov and Stalin met at the Turukhansk exile. At the end of September 1913 Yakov wrote to St. Petersburg deputies of the State Duma - the Bolsheviks: "Just parted with Vaska (Basil - one of the party nicknames Stalin - K.S. ), he stayed with me a week (Stalin was originally settled in the village of Kostino 50 miles from the Monastery -. K.S.) ... ". Right, so why did this 1981 English edition leave out these passages? I do not understand it. Your suggestion that it is about conforming to party line does not hold water. Sverdlov’s letters were first published in 1924, before Stalin was in full control, and so were available to use as a weapon in the battles between the Bolshevik leaders. Trotsky used them in his life of Stalin. 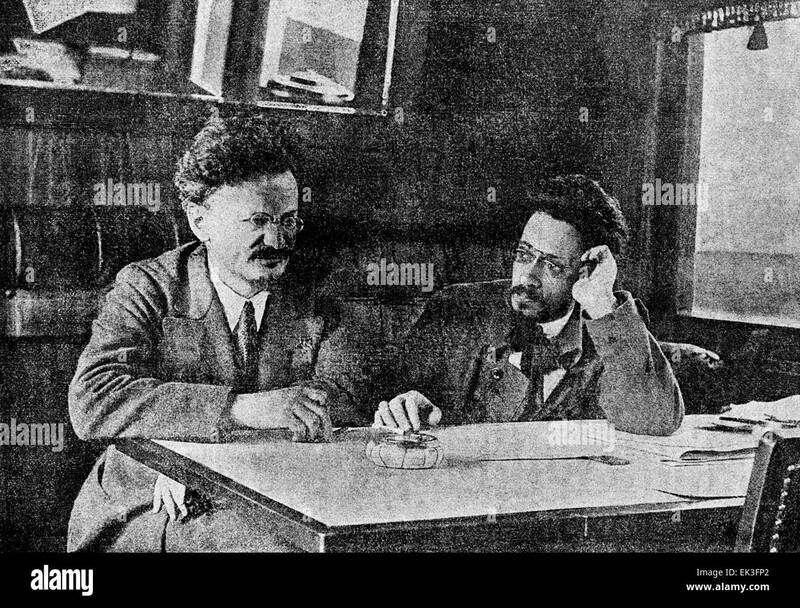 Incidentally I had many occasions to meet the assertion, widespread in our historical literature that Yakov Sverdlov in late 1912 - early 1913, worked in St. Petersburg together with Stalin, while this is absolutely wrong. Yakov arrived in St. Petersburg in the days 20s of December 1912, when Stalin was no longer there, going abroad. Stalin returned from abroad in mid-February 1913 after the arrest of Sverdlov, they did not meet in St. Petersburg and did not work together. Klavdiya is being disingenuous. Stalin and Sverdlov were both working on Pravda during December 1912 – February 1913, but Sverdlov was fixed in St. Petersburg while Stalin was moving around a lot (back and forth between Russia and Austria-Hungary). Right, so why did this 1981 English edition leave out these passages? I do not understand it. This is the process of Kamenev being written out of history, just like Sverdlov’s first wife. Now in the interests of possibly involving other voices in this discussion, I would like to raise the question of where libcom draws the line in accepting items for its library. I’m pretty sure there is a line, because there don’t appear to be any works by Lenin or Stalin in it. I’m all for inclusiveness, especially in the case of bibliographic rarities, but I have to question whether it’s necessary to copy over texts from M-L websites which are already readily accessible. In the case of Klavdiya Sverdlova’s biography of her husband, my concern would be to alert the reader that: (1) this is not a work of historical science, but belongs to an entirely different genre: Lives of the Saints; (2) the text has been changed numerous times to accommodate the CPSU’s changing views of its past; (3) the author is no stranger to censorship as she made it her speciality to censor children’s literature; (4) Yakov Sverdlov was a complex, fascinating person who deserves a proper study, but this isn't it. It is duly noted that Olga Edelman has written (somewhere?) that during Stalin's life Sverdlova recalled "strong friendship" between Sverdlov and Stalin, but not so anymore after Stalin's death. So you (or better Edelman) specifically claims this one change, though you (/Edelman) don't give concrete passages as example. In the Russian edition (online which I linked to, I guess 1960/76 are the same) Kamenev is in, but not in the English 1981 edition. So I think we can reasonably rule out any drastic shift in party line between 1976 and 1981. The answer why the English edition left out several passages may be quite simple. As the intro said: "The book is intended for the general reader." So although for communists and historians all the details about the numerous actors are very important, for the non-communist, non-Russian audience it might be less so. It's another question whether this English translation in the process of editing for the general audience distorted anything. So far you have not shown that (nor do I expect you to do that work, though it would be easy, as I linked the Russian text). texts from M-L websites which are already readily accessible. The M-L site is defunct, so this text wasn't readily available (and in order to make it readable I had to fix the mark-up). The M-L site seems to have wanted to collaborate with the Gutenberg-project to upload all their works to it, but that did not happen. The M-L site also contains for example works of Plekhanov, one of which I have uploaded to libcom (which wasn't even yet on Marxists.org). But you can rest assured that I do not plan to upload the whole site to here. Interesting discussion, thanks guys. Hope you don't mind Noa but I have edited in a bit of a critical intro, referring people to the discussion below. This is our policy on including articles from perspectives we don't necessarily agree with but reproduce nonetheless. yes, very good discussion, and i'm glad it's stayed comradely (not all disagreements do). btw, the book is short enough not to exhaust my attention span, so i might actually read it, with the commentary above at the ready. The caption reads: Ya. M. Sverdlov in a train carriage during a trip to the front in autumn of 1918. Слабый участок идеологического фронта (К вопросу о детской литературе) / На посту. 1925. № 1(6). Стб. 114–118. For example, one of the points she argues against is the superstitious ideology fostered in (old) fairy tales (submission to authority figures, reliance on magic etc.). Another point (that she also made in the book with regard to her own children) is that all "child-babble" type of talking/writing must be rejected. That's more relevant than ever, with the regression in the last few years in the level of TV-shows for kids, mind-destroying nonsense. Not all sectors of the ideological front are well-defended. Children's literature is weakly defended, as if it was of little interest for the proletarian state. Especially bad is the situation with regard to books for preschoolers. I wrote bad fairy tales. I acknowledge that they were not suitable for the building of socialism. I understand that anyone who declines to participate in the collective work of creating a new way of life is either a criminal or a corpse. ... Among the books which I intend to write for my personal "five year plan," first place is occupied now by "The Merry Collective Farm." Chukovsky's popularity seems to have provided him with some degree of immunity from repression, and he tried to help others not so fortunate. He was able to save his daughter Lydia, tainted with anarchism, but not Lydia's husband, the brilliant physicist Matvei Bronstein. Another point (that she also made in the book with regard to her own children) is that all "child-babble" type of talking/writing must be rejected. One might be wary of taking advice from Sverdlova on child-rearing. Andrei, the boy shown in the photo at the beginning of this thread, grew up to be a NKVD interrogator, known for his pathological cruelty. He tortured several of his former Kremlin playmates, the children of other high-ranking Bolsheviks. Particularly popular are Chukovsky's stories of Dr. Aibolit (based on Doctor Dolittle), cf. the Stalingrad Barmaley Fountain (statue of dancing children around crocodile, well-known for the photo of it against a burning background). It is perfectly legitimate to criticise his writing (or his argumentative justification for his style), just like it is to criticise Gogol or Kafka. The short haircut causes the confusion. The site where I took it from described the child as their son (Andrei was born in 1911), but the actual note on photo says it is their daughter Vera (born 1913), as does Sverdlova's book: Я. М. Свердлов и К. Т. Новгородцева (Свердлова) с дочерью Верой. Конец 1918 - начало 1919 года. grew up to be a NKVD interrogator, known for his pathological cruelty. I know, but that's not related to a particular view on parents' raising method or children's literature. It is perfectly legitimate to criticise his writing (or his argumentative justification for his style), just like it is to criticise Gogol or Kafka. Concerning the "Chukovshchina," Krasnaya pechat, 1928 No. 9/10. Sverdlova could be cited for telling bad fairy tales, because the group she describes never existed. All this would be sort of funny if the consequences weren't so serious: Chukovsky was deprived of the means of earning a living and had to resort to the self-abasing renunciation quoted earlier in order to feed his family. And while these attacks were going on (they continued for several years), his oldest daughter and her friends were imprisoned and exiled, their young lives in ruins, for forming an anarcho-syndicalist group and trying to publish a newsletter with a typewriter. Of course the consequences were to be much worse a few years later for dissident writers and their families. I'm not so sure, given the emphasis on Andrei's enlightened upbringing in Sverdlova's book. According to Arkady Vaksberg, Andrei started informing on his friends to the OGPU while still a teenager. Anyway, it's quite appropriate to include Andrei Sverdlov in this discussion because, according to the Soviet publishers of the 1957 edition, "preparation of the book for publication" was carried out by Andrei. A few words about Yakov Sverdlov's reputation in Russia today. His name was plastered all over the USSR: streets, schools, a major city, a major university, but that is all fading away (although he still has a whole province named after him). But he's not forgotten: the monarchists are still blaming him for the death of the tsar, and he is a favourite target for antisemites who interpret Soviet history as a Jewish conspiracy. Saner types try to unravel his relations with the other Bolshevik leaders and this may eventually lead to some startling discoveries quite unlike anything found in Sverdlova's book. Anyway, it's quite appropriate to include Andrei Sverdlov in this discussion because, according to the Soviet publishers of the 1957 edition, "preparation of the book for publication" was carried out by Andrei. Yes, it is mentioned here in the first footnote. Saner types try to unravel his relations with the other Bolshevik leaders and this may eventually lead to some startling discoveries quite unlike anything found in Sverdlova's book. I found it an informative book, better than I expected.